krapow: The Flavours of Vietnam Cookbook Giveaway! I love cookbooks! I go through different phases using certain cookbooks all the time and then neglecting them for long periods of time. I love it when something triggers me to dust it off and rediscover it again. It's a testament to a great cookbook that it keeps coming back to reveal more layers as you progress along your journey of discovery of a particular cuisine. 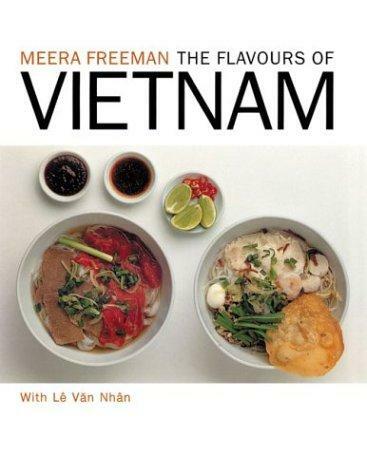 On of my favourite cookbooks in this regard is the very understated The Flavours of Vietnam by Meera Freeman and Le Van Nhan. This great little book is not a huge production, it has only a few photos and contains mostly text. Often the lack of photos is a major issue for me when it comes to cookbooks as I find it really helps to see what the meal your are attempting to reproduce actually looks like. The main reason that this isn't so much of an issue when it comes to The Flavours of Vietnam is because the book is basically a list of recipes for all the meals you find on most Melbourne Vietnamese restaurant menus. I find it very satisfying to be able to reproduce a meal that I have enjoyed in a restaurant days earlier and this book has been the key to many instances when I have achieved this. So what I'm saying is, you don't need the pictures, just go to a Vietnamese restaurant order your meal and hopefully enjoy it. Then go home and look it up in this book, head to Footscray, Richmond or Springvale to buy the ingredients and then just follow the recipe in this book. I guarantee you will come very close to reproducing the restaurant meal you enjoyed. Some of the recipe books out there have wonderful photos and list copious amounts of ingredients for a particular meal but when you go to try and cook it, it doesn't look or taste anything like the same meal from your favourite Vietnamese restaurant. That's not to say it doesn't taste delicious, just somehow different. A good example of this is the Nuoc Mam from Luke Nguyen's Songs of Sapa. I own and love all of Luke's cookbooks and watch his shows regularly but there is no way his Nuoc Mam (which is excellent) tastes at all like the version you get in the local Melbourne Vietnamese restaurants. This is probably due to all the regional variations which is understandable but also very frustrating to the home cook trying to reproduce a particular experience. On that point, I am starting to think that maybe Melbourne Vietnamese food is in itself a regional variation. We do have one of the largest populations of Vietnamese outside Vietnam so its not that crazy an idea. The Nuoc Mam from The Flavours of Vietnam is much closer to what I have found in many of the Melbourne Vietnamese restaurants so as I'm writing this I'm forming the view that this cookbook may not be an authenctic guide to Vietnamese food in general but it certainly is the best cookbook that I know of to showcase the regional variation of Vietnamese cuisine that is Melbourne. Ok so as usual, I need to get to the point. I have a brand new and unstained version of this cookbook that I am giving away to a lucky reader. All you need to do is leave a comment telling me about your favourite Vietnamese meal and the name of the restaurant at which you enjoyed it. Simple! I also need you to enter your email address in the 'Follow by Email' box to the top right of the screen so I have some way to contact you if you win. Alternatively, you can 'Like' krapow on Facebook. And that's it! I am happy to cover the cost of posting the book interstate or overseas within reason (I reckon about $10 should get it most places). Even better, if you are able to meet me on a weekday in the Melbourne CBD I will deliver it to you in person. Entries close on Sunday 29 April. I'll head to Springvale most weekends to shop & regularly pop into 'Pho Hung Vuong' in Balmoral Avenue for my Pho Bo with cooked brisket & sausage. I love their Pho for breakfast or brunch as it's incredibly therapeutic, especially when I'm hungover. It's interesting that so many Vietnamese restaurants in Melbourne focus on Pho (or pork rolls) and don't showcase the plethora of other Vietnamese dishes. Ah Springvale, the promised land... I agree with you about the focus on Pho. Personally I prefer a bowl of Bun Bo Hue or Bun Rieu over Pho these days. I reckon the whole Pho obsession is probably more to do with the customers than the restaurants though, I imagine that a Vietnamese restaurant that didn't sell Pho wouldn't last long. Thanks for your comment! A favourite Vietnamese meal?? That's like asking me to pick my favourite child! Well, a firm favourite is the Banh Bot Chien at Dong Que in Footscray. Those crispy rice flour cubes fried with egg, and doused in tangy Worcestershire sauce. Unusual, simple and so, so yummy. I bought a great little pre made takeaway version from LSM last weekend, only $4! favourite vietnamese meal was at a small restaurant (there was no signboard of course!) in Hue called Com Hen... unfortunately i have not come across this dish anywhere in Melbourne! Hi Krystile, I think we may have had the same experience in Hue! Check out this old post of mine. (http://krapow.blogspot.com.au/2012/01/es-teler-77.html) We asked our excellent cyclo driver for the specialty of Hue and were expecting Bun Bo Hue but he surprised us and took us to a Com Hen restaurant,. We loved it and went back for more the very next day. I've had Com Hen only once in Melbourne at the unlikeliest of places, Vietnamese Noodle House on Swanston Street. Thankyou for reminding me about it, I am now planning to head back there very soon to post about it. my favourite vietnamese meal is in the heart of Sunshine called Pho Hien Saigon, on Hampshire Rd. Its where there are many vietnamese grocery stores and everyone eats here. I go there with my partner, Colin (who found the resturant first) and we are generally one of the few "white people" there. They close early, but its worth going early. Their menu is simple and to the point. I always order thier prawn spring rolls for a shared starter and then the rice vermecelli with grilled chicken. The sauce is to die for!!!! Hi Tania, I've only been to Sunshine once and I remember it being very authentic. Thankyou for the recommendation, I think we'll be back out there again very soon. We also love 'Bun' salads and Nuoc Cham/Mam is eaten very regularly in our place. Check out some of my older posts for a recipe. My favourite vietnamese dish is com tam and grilled pork. Who knew broken rice and pig skin could taste so good. I'm always on the look out for a better version of this dish but my current favourite is at Hao Phong in Footscray. Hi Richard, I've never been to Hao Phong but will be rectifying that very soon. Broken rice is awesome! We love Com Tam Bi Cha Suon (Bi = shredded pork skin, Cha = dragon's eye omlette, Suon = grilled pork chop) and the runny fried egg makes the meal! Another great Bi dish is Banh Mi Bi from Nhu Lan.